She completed her MBBS from Trivandram Medical College in 1997 and DNB – Obstetrics & Gynecology (trained at Manipal Hospital, Bangalore) in 2003. Special interest in high risk pregnancy and medical disorder on pregnancy. Has worked in obs icu unit Regularly attends CME and Conferences related to Obstetrics care. I had a great experience with Dr. Garima. She spared lots of her time in listening to all my concerns and also patiently replied all of them. It helped me a lot in early recovery. My special thanks to nurses. Mrs. Aroni Mishra – Brookefield, Bangalore. I got to know about Apollo Cradle through advertisement and decided to give it a try. I was under the care of Dr Garima Jain and I can surely say I am thoroughly satisfied. Dr Garima is articulate and experienced. I did not face any problem during my procedure. It was a seamless experience. The centre is so welcoming and comfortable plus the staff is like a family. Mrs.Paromita Dutta – Brookefield, Bangalore. During my visit, I found the services to be extremely tailored to one’s needs. The support staff was extremely professional. Dr Garima is highly qualified and accommodating. She is a truly amazing person. There were almost no procedural delays and the services were of good quality. I would definitely recommend Apollo Cradle to all my friends and family members. Mrs.Saranya Surendran – Brookefield, Bangalore. I found out about Apollo Cradle through a brochure and I am not disappointed. Excellent, quality service and great staff. My delivery was administered by Dr Garima Jain, who is a very warm, compassionate person. Needless to say, it was a perfect experience. The team is highly skilled and professional. They are timely and prompt at all times. I wouldn’t hesitate to recommend Apollo Cradle to anyone I know looking for a quality healthcare. Mrs.B. Shilpa – Brookefield, Bangalore. I was admitted to Apollo Cradle under the care of Dr Garima Jain. My experience with Apollo Cradle was great. The hospital provides quality and value. Dr Garima was meticulous and paid great attention to detail. We did not have any problem throughout. The nurses were kind and professional as well. I will look forward to your services in the future. Mrs.Sonam Agarwal – Brookefield, Bangalore. I am extremely satisfied with my delivery experience at Apollo Cradle. It was such an empowering experience under the care of Dr Garima Jain. All my problems were catered to and solved. Dr Garima is highly qualified and understanding. She handled everything very professionally with a smile on her face. I would highly recommend Dr Garima and Apollo Cradle. Kudos to the entire team. My Apollo Cradle experience was wonderful. The staff is very attentive and accommodating. All my needs were catered to. I had a comfortable stay and the hospital was very clean. Under the care of Dr Garima Jain, I was well taken care of. She is professional, understanding, and extremely friendly. Overall, I am really happy with the services I received and highly recommend the experience. I had been to Apollo Cradle, Hoodi for my treatment under Dr Garima Jain. The experience was good, but they can improve a lot. The PRO did not have adequate knowledge and was not able to explain the packages. The only good part was the dedicated doctors and nurses who give their 100% in looking after you. The housekeeping was decent and the rooms were good too, but discharge process was delayed. I am very satisfied with the services and treatment I received at the Apollo Cradle, Hoodi. The ambulance arrived on time and was clean with trained staff. The front office was quick to act and admission formalities were completed smoothly. Dr Garima Jain and nurses were well coordinated and solved all our doubts. The housekeeping staff do a great job in maintaining the rooms. Overall a good stay. r Garima Jain of the Apollo Cradle, Hoodi made my experience so comfortable. The staff is well behaved and trained. They know how to handle and solve your doubts. The front office was very supportive during the admission and discharge. The housekeeping staff maintains the room well. The food quality is very good and healthy. I will recommend this if you are looking for quality health care. I had been to the Apollo Cradle, Hoodi before and this was my second time. I will recommend this if you are looking for quality services. The front office is well behaved and answer all your queries. Dr Garima Jain and her team took very good care and paid attention to all our concerns. Though they can improve on the food availability. Housekeeping did a good job in maintaining the rooms. The discharge process and billing services can be better. A friend referred me to the Apollo Cradle, Whitefield when I was due in July. I met Dr Garima Jain and the experience has been great. I can say they provide the best in class services. Right from admitting through treatment and discharge, the quality is maintained. Though they can improve on the nursing staff and train them for better communication, rest everything is up to mark. After seeing the advertisement of the Apollo Cradle, Marathahalli, I was admitted there for observation. I enjoyed the entire experience. Dr Garima Jain is very skilled and treats you with great empathy. The nursing team is amazing. They have great coordination and personally take care of your needs. The billing and discharge processes were completed on time. The food is good and rooms are well equipped. Thank you for the services. I was admitted to Apollo Cradle, Marathahalli for my delivery under Dr Garima Jain. I liked everything about them. Admitting and discharge formalities are easy and handled nicely by front office team. The team of doctors and nurses are very friendly and dedicated. The canteen food and housekeeping services are great. Great infrastructure. I thoroughly enjoyed the whole experience here. I am very happy that I chose Apollo Cradle, Whitefield for my delivery under the care of Dr. Garima Jain. We were explained the packages by PRO and got admitted. The on-duty doctor was very well behaved and took good care throughout the delivery. The nursing staff was very helpful, especially Geethu Sister took very good care. The management staff was very interactive and helpful. Special thanks to Riya. Everything was well planned and executed. Thank you for the great care. I consulted Dr Garima of the Apollo Cradle, Whitefield for my delivery and was really impressed. The doctor and her team have been a great support throughout my stay there. The nursing team provides great comfort and resolve all doubts. The management staff is also very cooperative and helpful. Though the food quality is good, they can still improve on housekeeping and room maintenance for an enhanced experience. I will surely recommend this to my family and relatives. I was admitted to Apollo Cradle, Whitefield under the care of Dr Garima Jain for observation in June. The plus point of this clinic is its staff. Being so helpful and polite, they give you a homely environment. The support from doctors and nurses gave me confidence. Though satisfactory, they can still improve on the housekeeping services. The food is good quality and served warm. Kudos to them! Keep up the good work. Big thank you to all the sisters, as they’re the ones who spend more time with patients, almost 24 hours. Thank you for taking such good care of me and my newborn angel, and also a big thanks to my doctor, Garima Jain for her expert guidance and suggestions. Our decision to go to Apollo was a good one. We came here specially because of Dr. Garima Jain, as we had heard a lot of good reviews about her. We got dedicated care from nurses and other staff. They are very competent in clinical matters and respond well in time to attend to your needs. We would like to extend our thanks to the front desk team, nurses, day/night staff and housekeeping staff. Overall our experience was very good in Apollo Cradle and were glad to be in such safe hands. Thank you Apollo Cradle, and to everyone in your support staff for the outstanding support given to me during my pregnancy, right from day 1 to my delivery. I can\’t express to you what that meant to me. And Dr. Garima Jain, you are perfect. My most sincere thanks to you for the kind of support you lent me! One of Apollo Cradle’s biggest plus points is their highly skilled and professional gynaecologists, especially my doctor, Garima Jain. The way they handle cases makes patients more confident and puts them at ease. I will be happy to recommend this place to my family and friends. Apollo Cradle boasts of highly experienced doctors and very efficient staff. They ensure that their billing processes are simple, and that their facilities, visitors management and food offerings are all comfortable for the patient. I’d like to thank everyone in the staff who helped make my stay comfortable. Ambience, service, doctors and nurses, everything is excellent in Apollo Cradle. I was extremely happy with my doctor, Garima Jain as she is experienced and very patient. Thank you to everyone in the centre. Dr Garima Jain was an absolute treat to consult at Apollo Cradle, my experience was truly nice with her. She treated me very well & encouraged me to have a normal delivery. Thanks to her expertise, everything went well. The mommy makeover and photo shoot was really good. All of us had a good time and my family too was happy to know that such events being organised for all the moms. Thank you Apollo Cradle. It was a wonderful experience here at Apollo Cradle, and I’d like to send out a huge, heartfelt thanks to all the members of the nursing staff there. Thank you for giving me service and care that was absolutely flawless. Thanks to Dr. Garima Jain too for her expertise and support. We were happy to experience excellent support from the entire nursing staff, since that’s extremely important for a new mother and baby. Thanks for loving care & service, expecially to my doctor, Aparna Jha. The other staff members were also supportive so thanks to them too. The experience with Apollo Cradle was awesome. We were delighted to have Dr. Garima Jain by our side. Her experience makes a lot of difference, and we were happy that she always gave the right advice. The nurses, housekeeping and front desk staff were very good too. Heartfelt thanks to all. The doctors\’ response was good, I was happy that I was catered to in good time. The nurses and other staff members were also very prompt, something which is very important after delivery. Even the room service was good. Thank you to every one who made my stay comfortable. The treatment and services provided by the hospital are very good. Proper care is taken by the doctors, nurses and other staff members. The house keeping staff is also good and the rooms are well maintained. The services we got were good, and we were happy to have come to Apollo Cradle. Dr Garima Jain has been a blessing to us. She was our guide, friend and biggest support. Our heartfelt thanks and gratitude to her and Dr. Sandhya Rani. All the wonderful doctors, consultants and the nursing staff deserve a special mention for making our birthing experience a memorable one. Thanks to advice and guidance of Dr. Madhavi, we were able to breastfeed our baby. 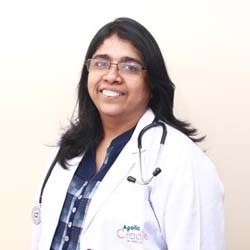 We were happy to find good expertise at Apollo Cradle, especially with our doctor, Garima Jain. The nurses, the front desk staff and housekeeping staff were very prompt. I\’m happy we selected Apollo Cradle to welcome our baby into this world. The overall experience with Apollo Cradle was fantastic right from the doctor\’s appointment and check ups, till the delivery and post delivery treatment. Extremely pleased with the behavior of the doctors, nurses and other supporting staff. Thank you all. I was very happy with my stay and experience at Apollo Cradle, where everyone, from doctors, nurses, housekeeping and front desk staff were very helpful and understanding. Special thanks to Dr Garima Jain, Dr Bhavani, and sister Sarita for being so supportive. I have been consulting Dr. Garima since the start of my pregnancy. We have followed her instructions & it was very fruitful. I had a very good experience with her. We were very impressed with her recommendations, whether exercises, diet or medicines, as she never gave me any unnecessary tablets or ointments, just asked me to follow nature\’s process. I\’ve heard from others that doctors always burden the patient with more medicines but thanks to her, I was very active, healthy & confident about my pregnancy & delivery. Not only her, but Dr. Prashanti, and Sarita & other nurses were really helpful during my delivery. Thank you Dr. Garima & the entire staff for taking care of me & my baby. We feel lucky that we had such wonderful doctors here at Apollo Cradle. Dr. Garima & Dr. Madhavi (lactation consultant) were angels for us. Our physiotherapist too was very helpful. Thanks everyone, for making our journey comfortable. We were extremely happy with Dr. Garima Jain, who is lively, knowledgeable & very caring. Her support throughout my pregnancy was commendable. We thank her & all the support staff who made this a comfortable stay. From the our bottom of hearts, we pray that the supreme Lord bless all of them. It was a wonderful experience. We were taken care of very well. Flawless execution, courteous staff. Honestly, we never expected the stay to be so comfortable. Doctors, paediatricians and supporting staff were so caring. Instead of us following up, all staff members followed up with us on processes and duties. They promptly visited us on time and did everything that was expected. The supporting staff kept our room very clean and we were very happy with the canteen services too. We can never forget the three days stay at Apollo Cradle, Brookefield, Bangalore. Once again, BIG THANKS. Apollo Cradle not only provides excellent service, but a homely environment too. We would like to thank all the doctors & every staff member in their various teams, who helped us during our stay. The management is very cooperative & always looking for feedback for improvement, on which they act promptly. Very happy with the doctors here at Apollo Cradle, with their level of professionalism, experience, patience and knowledge. We\’ve had a good experience here and will definitely recommend the hospital to others. We were very happy with the service at Apollo Cradle, whether it was our expert doctor, Dr. Garima Jain, or the nurses or everyone in the support staff. Keep it up, and good luck to you all. This is a special moment in everyone\’s life, and with just a little more care and effort, it can be more memorable for life. This is where we\’d like to thank Apollo Cradle for their services, care and understanding. An overall excellent experience, starting from my first ever visit to the doctor till when I was discharged. Apollo has never disappointed us at any point in time. Apollo Cradle, Marathahalli, has been wonderful when it comes to round the clock service. The nurses have never shown any form of frustration even when called at odd, late night hours. Special thanks to the 4th floor nurses, support staff at the hospital, and attendants walking in whenever required. I am thankful to the duty doctors and the peadiatricians who pay regular visits reassuming us when we are in doubt. A special thanks to the most special person, Dr Garima Jain for guiding me throughout my 9 months with nothing but a ver cheerful face and positive attitude. We were very happy to have Dr. Garima as our gynaecologist, and would like to mention that the front desk at Cradle was very helpful. Additionally, the nurses were very prompt and understanding. Happy to have come to Apollo Cradle. Excellent hospitality and care to the patient and baby. Thanks you. Let me first start with a token of thanks to you and your team in all the assistance provided to have our first baby, the whole journey was a great one. We always felt homely since the first day we stood at your reception table to enquire about Apollo Cradle. Its said that the first impression is the best impression, and this statement stand perfect in our experience. The kind of attention and assistance we have received from Priyanka and the reception team is truly something that we would remember for long. A special thanks from me and Soumya, specially to Dr, Garima, Priyanka, Niharika, Priya,Nurse Soumya, Nurse Laxmi and few more whose name i dont remember now, Dr, Mohit and your complete team. An overall excellent experience starting from my first ever visit to the doctor till this moment,just before discharge.Apollo has never disappointed us at any point in time regarding the nurses.Apollo,Marathahalli has been wonderfulwhen it comes to round the clock service.the nurses have never shown any form of frustuation even when called at the late night hours.special thanks to the 4th floor nurses,support staffs at the hospital,attenders walking in whenever required.I am thankful to the duty doctors and the peadiatricians who pay regular visits reassuming us when we are in doubt.A special thanks to the most special person Dr Garima for guiding me all 9 months with nothing but a very cheerful face and positive attitude. Overall experience was good in Apollo Cradle, Dr. Garima Jain and Dr. Sandhya Rani both are good. Good Support from nursing staff. Thanks. We are very happy with Apollo Cradle. We are completely satisfied with the doctor Dr. Garima Jain and the other staffs and housekeeping services. Delivered at Cradle Brooke fields by Dr. Garima Jain Overall satisfied. The front office executives and nurses were very helpful and empathetic. Very Good, Overall satisfied with the treatment at Apollo Cradle Brookfield’s. Thanks you. Delivered my baby boy at Cradle Brookfield’s with help of Dr Garima Jain. The staff and the doctor they went out of their way to help. very good experience here .Thank you so much Priya. Your team is awesome. Thank you is the smallest word for what Dr. Garima Jain has done for me. She is a very cooperative doctor which is what every pregnant woman would need during these nine months. She gives all the comfort and does everything best possible for the patient. Also I would mention the name of Dr. Sandhya Rani who was there in my labour room and played a crucial part in my delivery. Even at last notice she came and did the needful. I really want to thank you. Apollo Cradle Brookfield’s Team was very professional. We got admitted at very odd hour in night (1:30 am) & all staff and team are immediately available. Dr. Garima Jain response was simply superb. Highly professional care, Nurses is talented. Joined Pregnancy Support Classes (yoga classes) at Cradle –Brookfield; enjoying the session by Dr Shagufta, Also consulting Dr Garima too for consultation – so far it has been good, looking for delivery. Very happy without patient facility at Apollo Cradle Brookfield, Everything is fabulous including my gynaecologist. Good experience @ Cradle Marthahalli consulting. Planning to deliver at new Cradle facility with Dr Garima Jain, over experience during the consultation has been very good. My doctor Dr. Garima Jain and entire Cradle team Kundanahalli are fabulous. Keep up good work. Over all excellent experience. I would like thank Dr. Garima Jain and entire Cradle team for excellent care to me and my family. Delivered at Apollo Cradle Kundahalli. Great Name, Great Chain of hospital, personalised care: Extremely responsive team. Special thanks to my doctor. Over all experience at Apollo @ Cradle Brookfield’s has been very good till date consulted her at Apollo @ Cradle Brookfields. Night duty staff was extremely good. Thank you doctor Dr. and Cradle Team. Thanks to Dr. Garima Jain Over all experience Apollo Cradle has been very good. Over Good service. Did not have to wait long at all for my doctor appt (Dr. Garima) Over all good. Kindly maintain as it is. Consulting Dr Garima at Cradle Kundanahalli staffs are very interactive. Apollo Cradle has been in the top 5 searches for delivering our first child. My first interaction with Dr. Garima Jain assured me that I made a right choice. Our overall experience with Apollo Cradle has been very good. Doctor has given us right/ appropriate advice as per mother/ child condition. During our stay at hospital all staffs has been very supportive and cooperative. Looking forward delivering at Cradle. Good service from everyone in the hospital, doctors and receptionists, and you do not feel like you are alone thanks to you. Extremely Happy with services at Apollo Cradle Marthahalli Thanks to you. We are very much satisfied for all aspect of Apollo Cradle Brookfield hospital, Please modify your food. We are very much pleased with service: Thanks to Sister Vijayashanthi, Shobha & Anupama. Consulting Dr Garima Jain@ Cradle Brookfield Nice Experience. Very happy with Cradle and Dr. Consulting Dr Garima Jain @ Apollo Cradle. Very good and friendly environment.